If you or a loved one has sustained serious personal injuries as a result of a railroad or subway crash in New York or anywhere in the United States, consulting a qualified train accident attorney should be your top priority. When you hire the firm of De Caro & Kaplen, LLP to represent you, you receive counsel from nationally recognized legal experts who are knowledgeable in complex train accident litigation. In addition to being skilled attorneys, Shana and Michael are passionate victim advocates who believe railway companies and operators should be held accountable for their negligence. Our clients’ interests are the focus of every case we handle. to tell us about your case. For more than 35 years, attorneys Shana De Caro and Michael Kaplen have been helping train collision victims recover their losses and move forward with their lives. They have a long history of obtaining substantial settlements for our clients, who have endured injuries ranging from back and hip fractures to traumatic brain injury. Shana and Michael are also members of the Railroad Accident Trial Lawyers Association. What Kinds of Train Accident Cases Do We Take On? A Metro-North train was traveling at an excessive rate of speed when it flew off a sharp curve, killing four passengers and injuring more than 60 others. Kaplen warns injured passengers not to delay in their pursuit of legal action against the railroad. Our attorneys have found that in many cases, accidents involving subways, commuter trains, and freight trains are preventable. The most common causes of train derailments and collisions are poor maintenance of railroad cars, tracks, and signals as well as the error of engineers and conductors. Railroad crossing accidents are often avoidable if the rail company had properly designed and maintained the gate crossing. Train accidents don’t always involve a crash or derailment, however. Bystanders can slip and fall beneath a train and be crushed. Railroad workers can be injured as well, especially when they’re not provided with the proper tools, training, and equipment to ensure their safety while on the job. An unsafe worksite and unsafe railroad cars that lead to injury are the railroad’s responsibility and they can be held liable to any railroad worker. Our lawyers also work with a team of professionals to gain a clear understanding of the impact of your injuries. We strive to maximize compensation by considering not only medical costs, but also lost wages, future healthcare expenses, and even emotional suffering. Filing a lawsuit can be stressful. But our partners maintain a limited caseload in order to provide attentive client support and eliminate as much anxiety as possible. You’ll feel confident knowing you have a qualified attorney by your side at every step of your case. Concerned about the costs of hiring a lawyer? Don’t be. You pay no attorney fees unless we win a settlement or favorable judgment on your behalf. 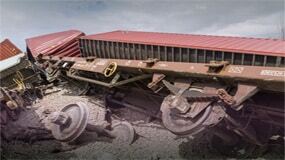 When it comes to initiating train accident lawsuits, there are strict time constraints in place. That’s why it’s important to act now. Contact us today to discuss your case.